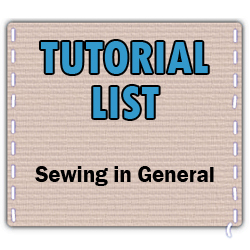 Here are links to almost completely thorough lists of the tutorials that are available on Craftster's Sewing in General boards. Some tutorials were excluded for lack of clarity and no tutorials listed solely on other sites were included. If you find another tutorial that you feel should be included here, please reply! This has obviously been quite a big undertaking and with so many pieces to the puzzle, some things may have fallen through the cracks. If you notice that a link is incorrect or a description is not correct, please let us know either here or in the specific tutorial list thread. We want this to be as easy to use as possible.